From mini robots to selfie drones and super-thin TVs: Here's the best we saw at CES 2017. 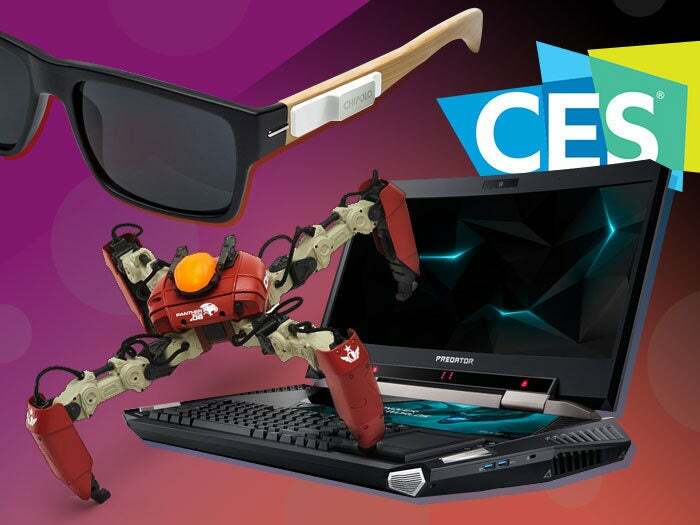 It's a few week into CES and by now you’ve probably read a few different stories across the web. You probably also know that this year, the Consumer Electronics Show really wow-ed us and we're still thinking about it. From virtual reality to concept cars, thousands of tech companies showcased what they think you'll buy in the coming year. While it’s difficult to see all the products at the show and narrow down the best gadgets, here are 10 of the most impressive in various categories. Drones have been very popular is the past few years and the Hover Camera Passport is a flying camera in a drone class of its own that will likely make it even more mainstream. It's an autonomous self-flying camera that follows you and records your travel moments in 13MP photos and 4K video. There's no controller for this drone; you'll be using your Android phone or iPhone to help navigate and to control it via WiFi. There's also a follow-me mode, so no matter where you go. Think of it as a personal paparazzi. The foldable, fully-enclosed Passport drone can be yours for $549. If you're sick of carrying around a bulky laptop charger then you will understand why we're excited about the Dart-C? They shrunk the whole charger (about four times smaller than most of the ones available in the market today) into a miniature size. The charger is specifically designed for the USB Type-C laptops. The list includes USB Type C laptops including Apple MacBook & MacBook Pro, Lenovo ThinkPad 13, ASUS ZenBook 3 and Dell XPS 13. Gone are those when laptop chargers looked bulky. DART-C is available starting January 2017. Belkin introduced two new smart home products at CES 2017, including the WeMo Mini smart plug and WeMo Dimmer light switch. Think of the smart plugs as outlet covers that allow you to control anything you plug into them with a smartphone app. With the smart plugs you can to stack two of plugs in a single wall outlet and wirelessly control lamps, heaters, fans, and more over Wi-Fi using the free WeMo app for iPhone. The WeMo Dimmer, like the Mini Smart Plug, is compatible with Amazon Echo and Google Home for dimming and on/off control via voice commands, as well as the Nest thermostat's "home" and "away" modes. WeMo Mini is available now for pre-order on Belkin's website for $34.99, and will be in stores later in January. The WeMo Dimmer will be available in the spring. Being out of battery is so 2016. This year at CES, Humavox, a startup that is ‘leading the charge’ presented a line of consumer gadgets aimed to blend wireless charging into our lives, including: A backpack, that looks like any other, but secretly charges any gadgets placed in it. Google cases for AR/VR and headphones cases - both automatically charge the device within them, as well as self-charging autonomous drones. With Humavox’s near-field radio frequency (RF) technology installed, any wearable or connected device can be dropped into any compatible 3D container, and be charged seamlessly, without even worrying about placement (“just drop & charge”). Toyota unveiled a concept car to highlight its vision for what its cars may look like in 2030 From wheels built directly into the body, see-through doors, and a modern clean interior and exterior, it was an exciting glimpse into a future.As Toyota Research Institute head Gill Pratt explained during the demo, that vision involves two things: making the car safer, and changing the way people interact with their vehicles. The car isn't fully autonomous, but Toyota believes you'll still want to drive yourself around 14 years from now.